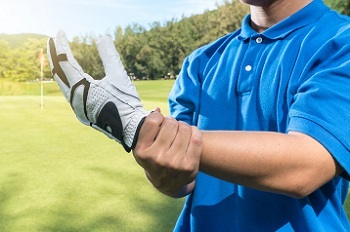 Golfers often experience wrist pain. Experiencing any discomfort, tenderness, and difficulty with motion is wrist pain. Some may experience the discomfort and tenderness all the time, while others may only notice it when they are playing sports or engaging in some other activity. The causes of wrist pain may vary, ranging from a break of the ligaments to a less serious injury. A common cause of wrist pain is a wrist sprain. Such sprains occur when your wrist stretches improperly, or it needs to bear a weight that it cannot handle. For instance, if an athlete falls and they put their hand on the ground to break their fall – the result can be damaging to the wrist. The ligaments in the area get stretched, which may result in tiny tears or a complete break. Wrist pain may also be the result of hitting the area, extreme pressure to the wrist or certain repetitive motions that are common in sports. Athletes who play basketball, baseball, tennis, and gymnastics are at increased risk of experiencing wrist pain due to sports injuries. Pain, swelling, tenderness, and bruising around the area. What is the treatment for wrist pain? The first step involves a proper examination, which may include an x-ray and MRI. Sports injury treatment includes rest, icing the wrist, compression bandages, taking anti-inflammatories or placing the wrist in a cast. Surgery may be necessary for a particularly bad ligament break but those circumstances are extremely rare. Sports medicine can help prevent the need for surgery. If you are experiencing unusual pain or tenderness on your wrist, it is important to get checked out by a professional sports medicine doctor. Dr. Bob Meyer at the Spinal Rehab and Sports Medicine clinic has extensive experience with such injuries. Dr. Bob will look at your wrist, run any necessary tests, and provide you with a clear diagnosis. He will also help you with sports injury treatment and rehabilitation, to ensure your wrist heals properly.